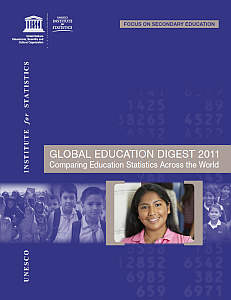 The UNESCO Institute for Statistics (UIS) announced the publication of the Global Education Digest 2011. The focus of this year's edition of the GED is on secondary education. Growing enrolment in primary education over past decades - partly due to the emphasis on universal primary education by the Millennium Development Goals and Education for All - has led to increased demand for secondary education. The Global Education Digest 2011 describes trends in participation in and completion of lower and upper secondary education from 1970 to the present, as well as disparities in access to education of children of secondary school age. The GED also contains analysis of data on educational attainment, technical and vocational education and training, secondary school teachers, and education finance. The analytical chapter is accompanied by 200 pages of statistical tables on pre-primary, primary, secondary and tertiary education. The GED 2011 introduces several new tables that did not appear in previous editions. Table 5 lists national, regional and global estimates of the number and percent of children of primary and lower secondary school age out of school. Table 19 introduces a new indicator of educational attainment, the percentage of the population 25 years and older with at least completed primary, lower secondary, upper secondary, post-secondary, or tertiary education. All data from the statistical annex will also be available in the UIS Data Centre. 8 September was International Literacy Day. On this occasion, the UNESCO Institute for Statistics (UIS) released a fact sheet with estimates of adult and youth literacy in 2009, the most recent year with data. The global adult literacy rate, for the population 15 years and older, was 83.7% in 2009, compared to 83.4% in 2008. The adult illiterate population fell from 796.2 million in 2008 to 793.1 million in 2009. 64.1% of the adult illiterate population were women. Adult literacy rates are lowest in sub-Saharan African and in South and West Asia (see Figure 1). In 11 countries, less than half of the adult population were able to read and write: Benin, Burkina Faso, Chad, Ethiopia, Gambia, Guinea, Haiti, Mali, Niger, Senegal and Sierra Leone. Youth literacy rates - for the population 15 to 24 years - are generally higher than adult literacy rates, due to increased school attendance rates among younger generations. The global youth literacy rate was 89.3% in 2009, compared to 89.0% in 2008. The youth illiterate population fell from 130.6 million in 2008 to 127.3 million in 2009. Youth literacy rates are lowest in sub-Saharan Africa (see Figure 2) and the five countries worldwide with youth literacy rates below 50% are from this region: Burkina Faso, Chad, Ethiopia, Mali and Niger. I released a new version of the rundo and rundolines programs to integrate the Stata statistical package with an external text editor. Version 4 of the programs supports Stata 12, released in July 2011, as well as previous versions of Stata. Users who upgrade from an older version of Stata to Stata 12 must install the new rundo and rundolines programs. The old programs are not compatible with Stata 12 because some keyboard shortcuts in Stata have changed. Users of Stata 8 to 11 can continue to use version 3.1 of rundo and rundolines. The article "Overage pupils in primary and secondary education" of June 2011 summarized data on school attendance from 36 countries and found that overage school attendance is common in sub-Saharan Africa. The countries with the highest share of overage pupils in the sample were Haiti, Liberia, Uganda, Rwanda, Cambodia, Ethiopia, Ghana, Madagascar, and Malawi. In Liberia, 93% of all pupils in primary and secondary education are at least one year overage for their grade and 84% are at least two years overage. This article takes a closer look at Liberia by analyzing data from the same Demographic and Health Survey (DHS) from 2007 that was analyzed for the earlier article. The official primary school age in Liberia, as defined by the International Standard Classification of Education (ISCED), is 6 to 11 years. The official secondary school age is 12 to 17 years. Given these school ages, a 6-year-old in grade 1 and a 7-year-old in grade 2 are in the right grade for their age. A 7-year-old in grade 1 would be one year overage and an 8-year-old in grade 1 would be two years overage. A 5-year-old in grade 1 would be one year underage. The graph below shows the age distribution of pupils in primary and secondary education in Liberia. Pupils who are in the right grade for their age or underage are in a small minority. 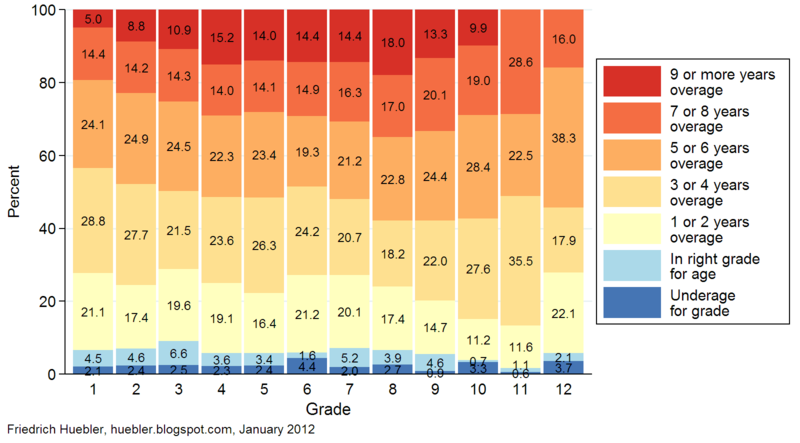 In the first twelve grades, their share never exceeds 9%. By contrast, as many as 98% of all pupils in a single grade are overage. The degree of overage attendance is astounding: 5% of all first graders are 9 or more years overage, meaning that they start primary school at age 15 or later. 19% of all first graders are at least 7 years overage and 44% are at least 5 years overage. In grade 8, 18% of all pupils are 9 or more years overage; while the official age for eighth graders is 13 years, one in five pupils in that grade in Liberia is 22 years or older. Source: Demographic and Health Survey (DHS) 2007. - Click image to enlarge. What are the reasons for this high prevalence of overage school attendance? In Liberia, as in other countries of sub-Saharan Africa, many pupils enter school late for a variety of reasons that include poverty, a scarcity of educational facilities, and lack of enforcement of the official school ages. High repetition rates further exacerbate the problem of overage school attendance. Among the consequences of this age structure in school are a higher probability of dropout and reduced lifetime earnings caused by incomplete education or late entry into the labor market. Pupils can be overage for their grade for two reasons: late entry and repetition. Take for example a country where children are expected to enter primary school at 6 years of age. If a child enters grade 1 at age 7, he or she is one year overage for the grade. A child who enters grade 1 at age 8 and repeats the grade will be three years overage for the grade; two of the three years are due to late entry and the third year is due to repetition. Children who are many years overage are less likely to complete their education. If they stay in school, they graduate later than pupils who entered school at the official starting age. These overage graduates enter the labor market late and often with lower educational attainment. As a consequence, they are likely to have lower cumulative earnings over their lifetime than persons who graduated and entered the labor market at a younger age and with higher educational attainment. For the country as a whole this in turn means reduced national income and slower economic growth. Overage school attendance is common in sub-Saharan Africa but also occurs in other regions. The figure below shows data from 36 nationally representative household surveys that were conducted between 2004 and 2009. 34 of these surveys were Demographic and Health Surveys (DHS) and the remaining two surveys, those for Bangladesh and Kyrgyzstan, were Multiple Indicator Cluster Surveys (MICS). For each country, the graph shows the share of children in primary and secondary education who are at least one or two years overage for their grade. The entrance ages and durations of primary and secondary education used in this study are those specified by the International Standard Classification of Education (ISCED). Source: Demographic and Health Surveys (DHS) and Multiple Indicator Cluster Surveys (MICS), 2004-2009. In the sample of 36 countries, the share of children who are at least one year overage for their grade ranges from 5 percent in Armenia to 95 percent in Haiti. Other countries where at least three out of four pupils in primary or secondary education are overage include Liberia (93%), Uganda (86%), Rwanda (83%), Cambodia (78%), Mozambique (76%), and Ethiopia (75%). In addition to Armenia, the percentage of pupils who are at least one year overage is below 10 percent in Moldova and Egypt (8%). The share of children in primary and secondary education who are at least two years overage for their grade ranges from 1 percent in Armenia to 85 percent in Haiti. In addition to Haiti, at least half of all pupils are two or more years overage in Liberia (84%), Uganda (67%), Rwanda (65%), Ethiopia (59%), Cambodia (55%), Malawi (51%), and Madagascar (50%). On average, the share of children who are at least two years overage is 19 percent less than the share of children who are at least one year overage. However, there are exceptions. In Albania and the Ukraine, 43 and 26 percent respectively of all children in primary and secondary education are at least one year overage. By contrast, only 5 and 2 percent respectively are at least two years overage. This means that in these two countries, a relatively large number of children enter school one year late or repeat one grade, but hardly any children enter school two years late or repeat more than one grade. Late entry and repetition are therefore less likely to have negative consequences on lifetime earnings and national income in Albania and the Ukraine than in other countries. 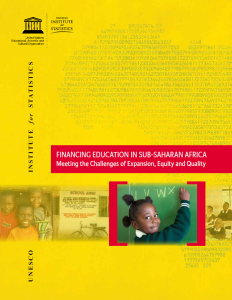 A new report by the UNESCO Institute for Statistics, Financing education in sub-Saharan Africa, presents comprehensive data for the past decade for 45 African countries. The number of children enrolled in primary school in sub-Saharan Africa grew from 87 million in 2000 to 129 million in 2008, an increase of 48 percent. Over the 1999-2009 decade, real public expenditure on education, adjusted for inflation, grew on average by 6.1 percent per year, based on data from 26 countries. The highest annual growth rates of education spending in sub-Saharan Africa, over 12 percent, were observed in Mozambique and Burundi. Of the countries with data, only the Central African Republic experienced a decline in public expenditure on education. The countries of sub-Saharan Africa combined spend 5.0 percent of their GDP on education, the second highest value of the eight EFA regions, after North America and Western Europe, where 5.3 percent of the regional GDP is spent on the education sector. The figure below shows data on education expenditure in 28 countries in sub-Saharan Africa. The horizontal axis indicates a country's total public expenditure as a percentage of gross domestic product (GDP). The vertical axis indicates a country's total public expenditure on education as a percentage of total public expenditure. Total public expenditure on education as a percentage of GDP can be calculated as the product of the two values plotted along the vertical and horizontal axes. 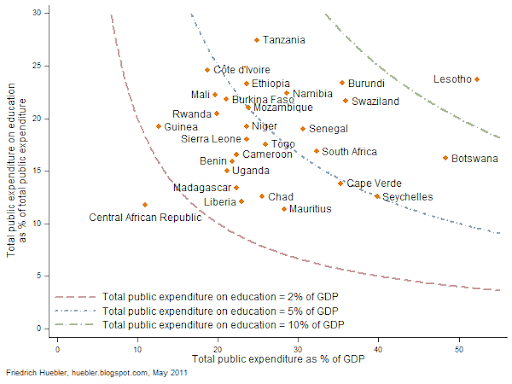 The three curves in the graph indicate where total public expenditure on education is equal to 2, 5 or 10 percent of GDP. Countries with higher expenditures on education as a percentage of GDP are found near the upper right corner of the graph, countries with lower expenditures near the lower left corner. For the countries in the graph, public expenditure on education as a percentage of GDP ranges from 1.3 percent in the Central Africal Republic to 12.4 percent in Lesotho. Update to "Integrating Stata and external text editors"
The guide to integrating Stata with an external text editor has been revised. The rundo and rundolines programs were updated to support Stata version 11.2, which was released on 30 March 2011. Some links in the guide were also updated. These regions, shown in the map below, are used in publications like the EFA Global Monitoring Report by UNESCO or the Global Education Digest by the UNESCO Institute for Statistics. Combined, the eight EFA regions cover 204 countries and territories. Two EFA regions - East Asia and the Pacific, and Latin America and the Caribbean - are further divided into two sub-regions. Andorra, Austria, Belgium, Canada, Cyprus, Denmark, Finland, France, Germany, Greece, Iceland, Ireland, Israel, Italy, Luxembourg, Malta, Monaco, Netherlands, Norway, Portugal, San Marino, Spain, Sweden, Switzerland, United Kingdom, United States. Albania, Belarus, Bosnia and Herzegovina, Bulgaria, Croatia, Czech Republic, Estonia, Hungary, Latvia, Lithuania, Montenegro, Poland, Republic of Moldova, Romania, Russian Federation, Serbia, Slovakia, Slovenia, The former Yugoslav Republic of Macedonia, Turkey, Ukraine. Armenia, Azerbaijan, Georgia, Kazakhstan, Kyrgyzstan, Mongolia, Tajikistan, Turkmenistan, Uzbekistan. Brunei Darussalam, Cambodia, China, Democratic People's Republic of Korea, Indonesia, Japan, Lao People's Democratic Republic, Macao (China), Malaysia, Myanmar, Philippines, Republic of Korea, Singapore, Thailand, Timor-Leste, Viet Nam. Australia, Cook Islands, Fiji, Kiribati, Marshall Islands, Micronesia (Federated States of), Nauru, New Zealand, Niue, Palau, Papua New Guinea, Samoa, Solomon Islands, Tokelau, Tonga, Tuvalu, Vanuatu. Afghanistan, Bangladesh, Bhutan, India, Iran (Islamic Republic of), Maldives, Nepal, Pakistan, Sri Lanka. Algeria, Bahrain, Djibouti, Egypt, Iraq, Jordan, Kuwait, Lebanon, Libyan Arab Jamahiriya, Mauritania, Morocco, Occupied Palestinian Territory, Oman, Qatar, Saudi Arabia, Sudan, Syrian Arab Republic, Tunisia, United Arab Emirates, Yemen. Angola, Benin, Botswana, Burkina Faso, Burundi, Cameroon, Cape Verde, Central African Republic, Chad, Comoros, Congo, Côte d'Ivoire, Democratic Republic of the Congo, Equatorial Guinea, Eritrea, Ethiopia, Gabon, Gambia, Ghana, Guinea, Guinea-Bissau, Kenya, Lesotho, Liberia, Madagascar, Malawi, Mali, Mauritius, Mozambique, Namibia, Niger, Nigeria, Rwanda, Sao Tome and Principe, Senegal, Seychelles, Sierra Leone, Somalia, South Africa, Swaziland, Togo, Uganda, United Republic of Tanzania, Zambia, Zimbabwe. Argentina, Bolivia (Plurinational State of), Brazil, Chile, Colombia, Costa Rica, Cuba, Dominican Republic, Ecuador, El Salvador, Guatemala, Honduras, Mexico, Nicaragua, Panama, Paraguay, Peru, Uruguay, Venezuela (Bolivarian Republic of). Anguilla, Antigua and Barbuda, Aruba, Bahamas, Barbados, Belize, Bermuda, British Virgin Islands, Cayman Islands, Dominica, Grenada, Guyana, Haiti, Jamaica, Montserrat, Netherlands Antilles, Saint Kitts and Nevis, Saint Lucia, Saint Vincent and the Grenadines, Suriname, Trinidad and Tobago, Turks and Caicos Islands. The Education for All Global Monitoring Report 2011 was released by UNESCO on 1 March 2011. 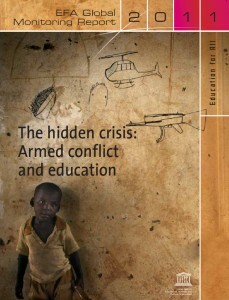 This year's edition of this annual report has the title The hidden crisis: Armed conflict and education. The report documents the impact of violent conflict on education and the long-lasting negative effects on educational attainment and literacy. Today, 28 million or over 40 percent of all children out of school (67 million worldwide) live in countries affected by conflict, although these countries are home to only 116 million or 18 percent of the global population of primary school age (653 million) (see Figure 1). (Only out-of-school children in low and lower-middle income conflict-affected countries were counted to arrive at the total of 28 million. In addition, for large countries like India, Indonesia, Nigeria and Pakistan, only children living in conflict-affected areas were included in the 28 million children affected by conflict.) 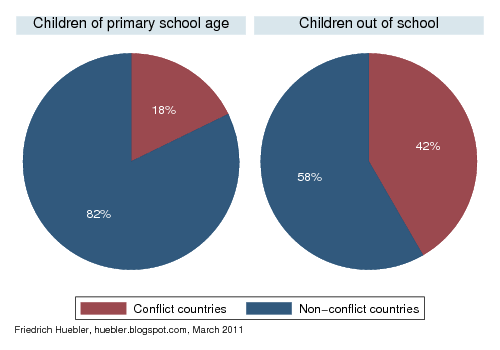 In conflict areas, the out-of-school rate is around 24 percent, compared to 7 percent in other parts of the world. Children affected by armed conflict are thus more than three times as likely to be out of school as other children. Conflict-affected countries also have some of the lowest levels of literacy. In these countries, only 79 percent of youth between 15 and 24 years and 69 percent of adults are literate, compared to 93 percent of youth and 85 percent of adults in other countries. War does not only destroy lives and schools, it also diverts resources from education to military spending. The Global Monitoring Report documents how lack of access to education or exposure to the wrong kind of education can contribute to persistent inequality, prejudice and renewed armed conflict, a vicious cycle that is difficult to break. Lastly, the Global Monitoring Report 2011 examines the role of development assistance in conflict-affected countries and argues for increased and more effective aid for the education sector. Source: UNESCO 2011, pages 132, 308, 309; author's calculations. The UNESCO Institute for Statistics (UIS) has released new time series with education data for the years since 1970. Until this release, most indicators in the UIS Data Centre only had data for 1999 and later years, except for literacy, for which the UIS offered data for the period since 1975. The historical data are compliant with the International Standard Classification of Education (ISCED) of 1997 and therefore comparable with existing post-1998 data in the UIS Data Centre. 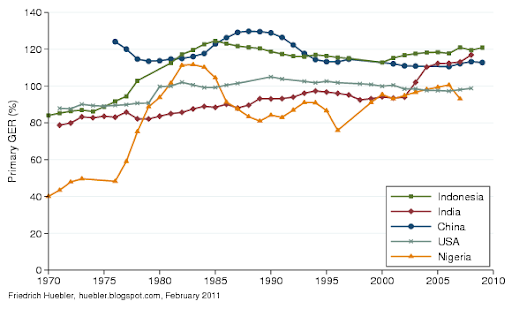 As an example for the expanded coverage, Figure 1 shows the gross enrolment ratio in primary education for China, India, Indonesia, Nigeria and the United States, the five countries with the largest population of primary school age in 2010, for the period 1970-2009. 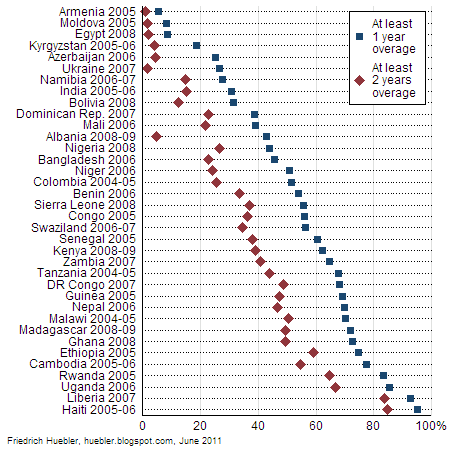 Figure 2 shows how school life expectancy evolved in these countries over the same period. The time series can be retrieved from the UIS Data Centre, under "Predefined Tables" and "Education". Data for the years 1970 to 1998 are in Tables 21 to 26, and data for 1999 and following years are in Tables 1 to 20H. As an example, the primary GER in Figure 1 is available in Tables 5 (for 1970-1998) and 23 (for 1999-2009). To create a complete time series for 1970-2009, the data from Tables 5 and 23 must be merged after download from the Data Centre. Data on school life expectancy are in Tables 8 and 22. In the United States, the level of education of the adult population has increased steadily since the middle of the 20th century. The share of the population 25 years and over who attended college increased from 10 percent in 1940 to 56 percent in 2009. 30 percent of the population in this age group had completed 4 or more years of college in 2009. The share of the population with only elementary education or no formal schooling fell from 60 percent in 1940 to 6 percent in 2009. High school reached its peak as the most common level of education in the 1970s and 1980s, with a share around 50 percent, but younger cohorts are more likely to continue their education at the post-secondary level. This increase in educational attainment of the work force has contributed to a strengthening of U.S. competitiveness in the global economy. At the same time, the increased demand for highly skilled workers emphasizes the importance of secondary and higher education for individuals in search of employment. 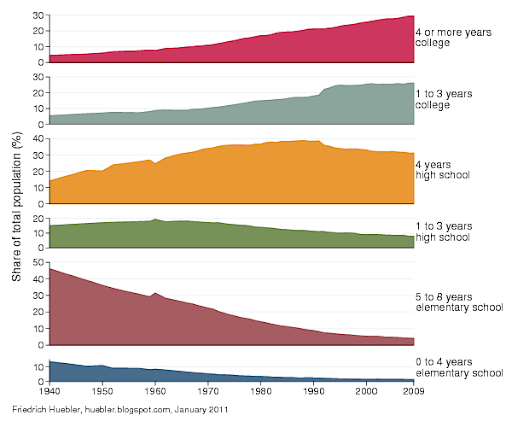 The trends in years of schooling of the adult U.S. population from 1940 to 2009 are visualized in the figure below. The table that follows lists data for selected years. The data on educational attainment were collected with the Current Population Survey (CPS), a joint survey by the Bureau of Labor Statistics and the Census Bureau that has been conducted since 1940.